Many moons ago, I was teaching a fall-quarter writing class in a continuing education program at a local university. (I really loved it; my students were unequivocally excited to be there, and were therefore awesome.) Thanksgiving had just passed, and I wanted my class to write a descriptive essay. Maybe I was hungry (surprise)—so I asked them to describe their kitchens in the aftermath of the big holiday meal. One of my students wrote so poetically about the trash she had left over—vanilla, pecans, brown sugar, butter—that I had to ask her what dish formed such delicious-sounding kitchen detritus. (Yes, I realize that “garbage” is becoming an unfortunate theme in my food writing.) She then sent me the recipe for her holiday squash casserole. I shared it with the whole class. I shared it with everyone. Fortunately, at the time I was receiving super-heavy CSA boxes filled with every conceivable kind of gourd, and they all tasted great in this recipe. A few points: Yes, canned pumpkin is convenient, but it’s really not that hard to roast your own squashes. I never peel them though: Have you ever tried to peel a butternut squash? Total pain. Here’s the easy way (another common theme of mine): Instead, just cut your gourd in half (pumpkin, acorn, butternut), scoop out the seeds like you’re about to carve it, and lay it face down on a foil-lined or greased baking sheet. Poke some holes in the back with a fork, and roast at 350 degrees Fahrenheit for about an hour and/or until a chopstick can pierce the gourd’s flesh with no resistance. Then, make sure you give yourself enough time for the squash to cool off. Wrestling with hot gourds is no fun. But once things have cooled down, gently scoop out the insides, leaving the skin behind. (One large butternut squash should give you the four cups needed for this recipe.) 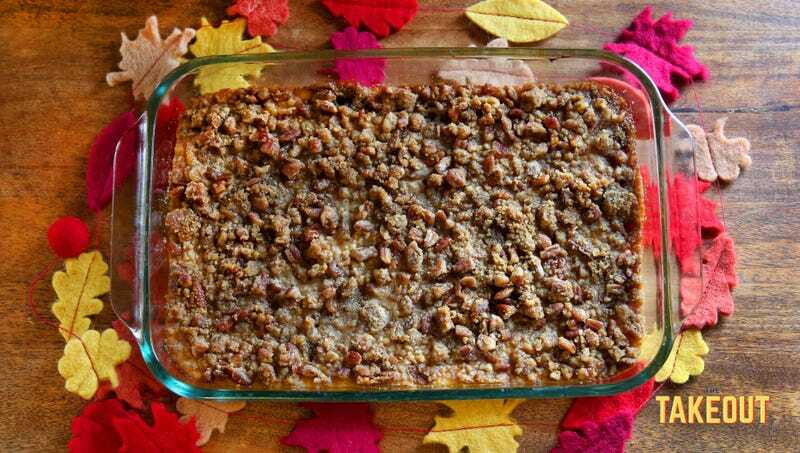 Then mix things up, top with the pecans and brown sugar, and become a holiday hero. Yes, it’s probably the butter and the sugar that make the casserole extra-delectable, but hey, you can add some health points with the vitamin A and the beta carotene in the squash. And the recipe works with any kind of squash—even sweet potatoes. Thank you, former student whose name I sadly don’t even remember (hey, it was 10 years ago) but whose squash casserole I will never stop making and eating. I actually just had some for breakfast. Mix well and pour into buttered pan. Combine crumble topping ingredients and distribute evenly over squash mixture. Bake at 350 degrees Fahrenheit for 35 to 45 minutes uncovered. Could be a dessert or a side dish (or breakfast), but you’ll be viewing the bottom of your casserole dish before you know it. Last Call: What food are you most looking forward to eating on Thanksgiving?